﻿ Hebrews 1:7 And of the angels he saith, Who maketh his angels spirits, and his ministers a flame of fire. And indeed toward the heavenly agents he says, He who makes his agents spirits, and his ministers a flame of fire. But God said [this] about the angels [Psa. 104:4 LXX], "He [i.e., God] makes His angels to be [like] winds and His servants [like] flames of fire." [Note: The idea is probably that angels obediently serve God's purpose similar to the way wind and lightening do]. 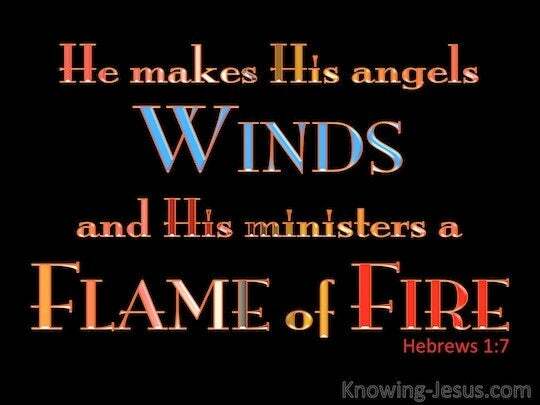 And of the angels he says: Who makes his angels winds, and his ministers a flame of fire. 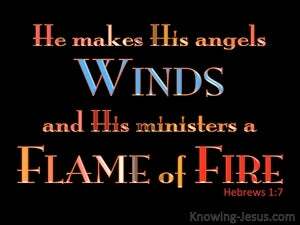 and of the angels, he saith, who employs his angels like the winds, and flames of fire as his ministers." In speaking of the angels he says, "He who changes his angels into winds, And his attendants into blazing fire!" And truly to the angels of God he says, Who making his angels spirits, and his workmen flames of fire. And concerning the angels he says, "The one who makes his angels winds, and his servants a flame of fire,"
And of the angels He says, "Who makes His angels spirits and His ministers a flame of fire." And of the angels he saith, "He maketh his angels spirits, and his ministers flames of fire." 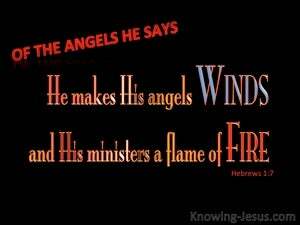 While of the angels he said, He makes his angels into winds, His ministering servants into flames of fire. And of the angels he saith: "Who maketh his angels winds, and his ministers a flame of fire;"
And concerning the angels indeed he thus speaks: "Who maketh his angels spirits, and his ministering servants a flame of fire." However, regarding the angels He says: "He turns His angels into winds, and His attendants into flames of fire." And as to the angels He saith, "Who maketh his angels spirits and his ministers a flame of fire:"
6 And again, when he bringeth in the first-begotten into the world, he saith, And let all the angels of God worship him. 7 And of the angels he saith, Who maketh his angels spirits, and his ministers a flame of fire. 8 But to the Son, he saith, Thy throne, O God, is for ever and ever: a scepter of righteousness is the scepter of thy kingdom. And it came to pass, as they still went on, and talked, that behold, there appeared a chariot of fire, and horses of fire, and parted them both asunder; and Elijah went up by a whirlwind into heaven. And Elisha prayed, and said, LORD, I pray thee, open his eyes, that he may see. And the LORD opened the eyes of the young man; and he saw: and behold, the mountain was full of horses and chariots of fire around Elisha. Above it stood seraphim: each one had six wings; with two he covered his face, and with two he covered his feet, and with two he flew. A fiery stream issued and came forth from before him: thousand thousands ministered to him, and ten thousand times ten thousand stood before him: the judgment was set and the books were opened. Are they not all ministering spirits, sent forth to minister for them who shall inherit salvation?